Want more information on Dental Implants? Click Here! If you have ever lost a tooth, you understand the discomfort a missing tooth can cause. Whether it is physical discomfort, or social discomfort, having a missing tooth can be a real problem. Thankfully, modern dental technology has made it so that missing teeth can be safely, and permanently replaced. This wonderful dental treatment is called a dental implant. Dental implants act a bit like natural teeth roots, except they are actually special alloy posts that are carefully placed in your jawbone. After an implant is placed and your mouth has had time to heal, our team can then attach either a porcelain crown or other dental device, helping to restore functionality and appearance to your smile. A dental implant can successfully replace a missing tooth, or provide an anchoring point for a dental device such as a permanent denture. If you are replacing one tooth with a dental implant, a beautiful porcelain crown will be anchored to the implant, effectively making a “new tooth”. If you are replacing multiple teeth, dental implants are a great way to permanently anchor a full or partial denture. 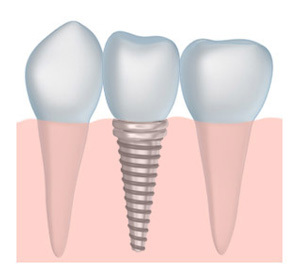 Dental implants act a lot like a natural tooth root. If you’ve had a tooth extracted, it can cause your jawbone to weaken, because it has lost the support created by the tooth that used to be there. A dental implant helps restore this support, and helps your jaw to stay healthy. We are excited to be able offer both dental implants used for single tooth restorations, and dental implants for dentures so that our patients can reap the benefits of these great treatments. Our team has experience in this wonderful dental technology, and will do their very best to make sure you get the top quality treatment you deserve. Interested in getting a dental implant, or have questions about this treatment option? Go ahead, give us a call today!